The upcoming flagship from OnePlus, the OnePlus 7 has already been the victim of many leaks, speculations and rumours. However, now some news has surfaced related to the launch of the OnePlus 7. As per tipsters, the new phone will be launched by the Chinese OEM precisely a month from now on May 14. This time around, there have already been leaks about OnePlus launching multiple variants of its latest phone. Notably, this would be the first time that OnePlus is doing something like this. As such, on the May 14 launch event, the company is expected to launch the OnePlus 7 Pro and the OnePlus 7 Pro 5G alongside the OnePlus 7 vanilla variant. The news comes from tipster Ishan Agrawal who has revealed the remaining variants of the OnePlus 7 smartphone which will be launched alongside the vanilla variant of the phone. The tipster has also informed the launch date of the phone to be May 14. There has also been a leaked poster image of the OnePlus 7 which reveals the tagline of the new OnePlus flagship – ‘Go Beyond Speed’. Although there has been no confirmation from OnePlus about whether or not this is going to be the official tagline of the new phone, the same image had surfaced a few days back on the Chinese social media website Weibo too. If the rumours are to be believed, then this would be the first time that OnePlus would be launching multiple variants of its phone in a single launch event, as we mentioned above. Previously, OnePlus has launched multiple RAM and storage variants of its phones but never different options of its phone which were apart from each other. 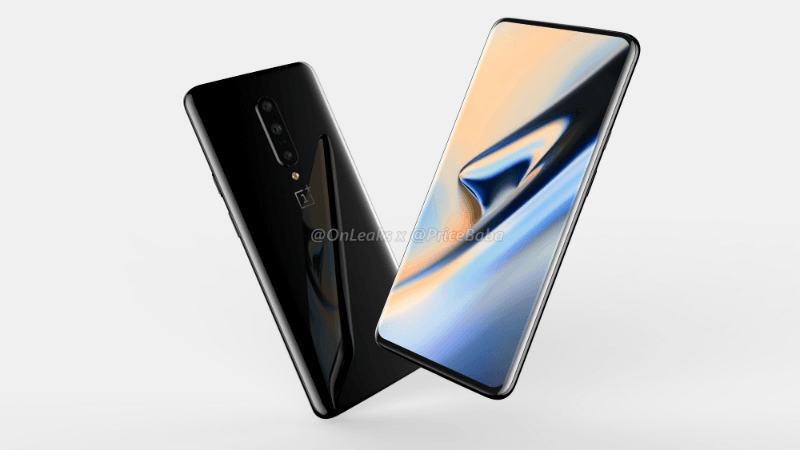 As for what the OnePlus 7 packs, there have been plenty of case renders and leaks which reveal a lot about the design of the OnePlus 7. The first highlight of the OnePlus 7 is the triple rear camera setup on the back side which will be vertically stacked with a LED flash. The case renders also reveal cut-outs for the USB Type-C port, loudspeaker grille and two microphones as well. Another leak which succeeded the previous leaks pointed out that there are cut-outs on the bottom edge of the phone which will house the SIM tray. Another big highlight of the case render is the cut-out on the top side of the phone which will supposedly accommodate the pop-up selfie camera. According to another image leak of the phone, the OnePlus 7 will also sport dual edge display similar to the Galaxy S10+. The phone has also been teased to come with the 6.67-inch Super Optic display, a Qualcomm Snapdragon 855 SoC which will pair up with 8GB RAM, 256GB of internal storage. The triple rear camera sensor on this device will come with a 48MP sensor, another 16MP sensor, and a last 8MP sensor. On the software front, the phone will run the Android 9 Pie.